How about you Reds, holiday traditions? RHYS BOWEN: We gave up stockings only recently although Daughter Anne and I still exchange. One tradition is mince pies and sausage rolls as we open presents. Another is that the tree gives us another small present in the afternoon..
JULIA SPENCER-FLEMING: Our Christmas Eve traditions: Go to the 5:00 service at St. Luke's (the one with the Christmas Pageant in it!) pick up Chinese take out, and watch DIE HARD at home, all snugged up together in front of the wood stove.There will be a huge missing piece in our Christmas Eve this year, so the children and I are getting away from our house, and snowy Maine - all the way to Hawai'i! Where we will probably...go to the service at the Episcopal church in Hilo, get Chinese takeout, and watch DIE HARD. HALLIE EPHRON: Everyone stays here on Christmas eve--two little grandkids, my 2 daughters, my son-in-law. The Night Before Christmas must be read aloud. The radio tuned into Christmas music. A delicious Xmas eve dinner served early before the little ones turn crabby (shhh, I'm making a lobster bisque this week and freezing it) that includes potato latkes and Hanukah cookies (mandelbrot). I know, Hanukah will be over, but so what? And Xmas-eve night my daughter and I put together something yummy/yeasty to cook the next morning after presents are opened. Sticky buns in years past. This year we're making jelly donuts. 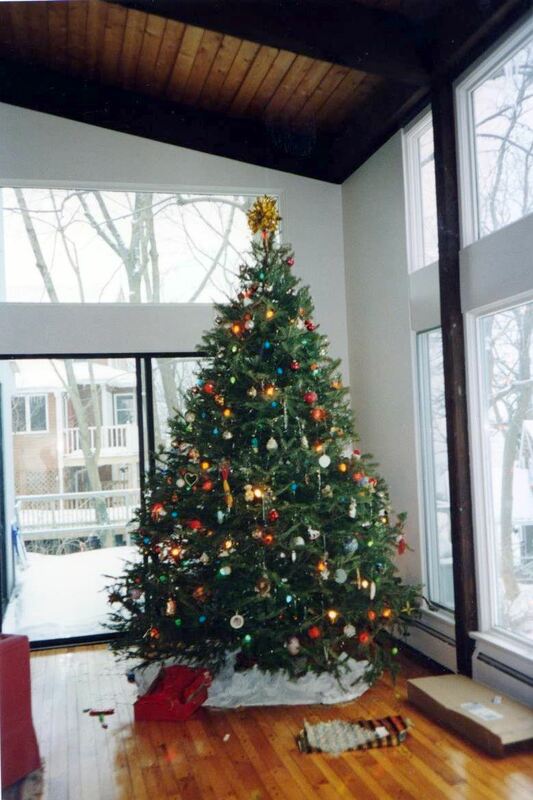 Here's a picture of Christmas morning when I was little, a tree so big my dad always had to cut the top off to get it into the house. We trimmed it Christmas eve. DEBORAH CROMBIE: We are a stocking family, too, and vow never to give it up. And this year we will have a stocking for Wren, such fun! When Kayti was little we read The Night Before Christmas aloud on Christmas Eve, along with A Child's Christmas in Wales. I still try to read both, just for myself. These days we go to my in-laws for a big Christmas Eve party. (There are five siblings, with sibs' others, sibs' kids, and now sibs' kids' kids, and always some non-family friends.) It's great fun, but I often long for a quiet Christmas Eve in front of the fire, with hot chocolate and a movie or a book. Christmas morning the kids come over as soon as we're all up. We do stockings, then breakfast (with something sticky!) then the tree. We used to go to my aunt's for Christmas dinner but the last few years we decided we really wanted to stay home. However, the quiet Christmas Day has evolved into a proper Christmas dinner for eight to ten people! But I love having family and friends around the table to celebrate. INGRID THOFT: Christmas Eve includes a delicious meal, new PJs for the grandkids from Nana, reading “The Night Before Christmas,” a viewing of the Grinch, and the stuffing of stockings for both kids and adults. The last few years, I prepped baked French toast to be popped in the oven on Christmas morning. This year, I decided to let someone else do the work, so I ordered cinnamon rolls from Zingerman’s in Ann Arbor. Fingers crossed they taste as good as the French toast. My photo shows a Thoft tree from years past. We were more ambitious then, but trimming a smaller tree is definitely a more peaceful process! JENN MCKINLAY: Stockings! So much fun. We still do those, too, and we always have a wind up toy in it. No idea how this tradition started but I have a collection of windup toys that is unequalled. 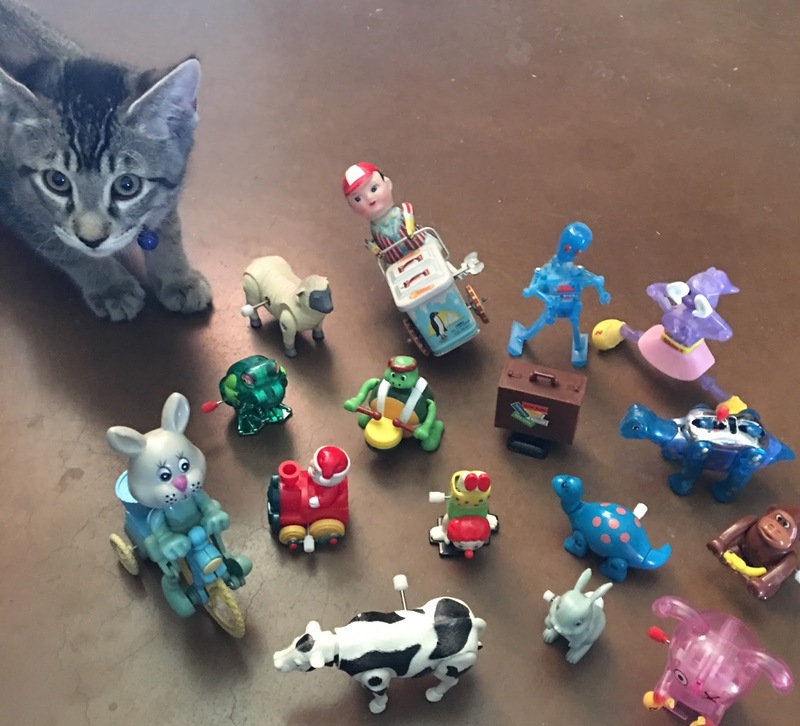 My picture is our newest kitten, King George, playing with a few years worth of windups. I had to check and make sure i hadn't already given the ones I bought this year. When I was a child and when the Hooligans were little, we always read Twas the Night Before Christmas and left out a plate of cookies and carrots (reindeer get hungry, too). Now that they're older we have a make your own pizza party and watch a Christmas movie together. It's still lovely just to be together. Red readers, what will you be doing today and tonight? Any special Christmas eve traditions? Christmas Eve Midnight Candlelight service . . . .
can last-minute present-wrapping be a tradition? Everything’s been bought long ago [and stashed away], but somehow the present-wrapping always ends up as a last minute thing . . .
Stockings! Yes, yes, yes. Hanging in front of the fireplace . . . .
We’ve been getting together the past few years at one of my sister’s children’s homes. It’s nice to have all the family together, but we’ll also have a family dinner here . . . . When I was a child we always had stockings, with oranges or tangerines in the toe, but everything was saved for Christmas morning. No special sticky buns or cinnamon rolls, as my mother was not much of a cook. No read-aloud poetry, or tree-trimming, or any of that stuff, and I have no idea why. Probably because my parents were both teachers and, after semester finals and calculating all those grades, they were just grateful to finally get Christmas break. 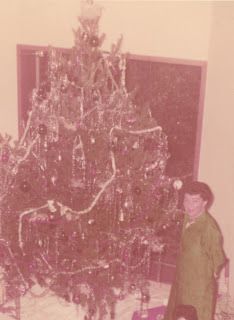 We did always have a tree, with lots of that slippery tinsel you had to sort of throw at it. The one thing we did every year, though, was go to my grandparents' house in Kansas City and spend much of the week between Christmas and New Year's. My aunt would come in from San Francisco, we'd catch up on all the family gossip, and we'd always get a really hard jigsaw puzzle that would take us most of the week to finish. One of the dogs would inevitably eat one of the pieces, but the rest of us noshed down on cheddar cheese popcorn while my grandmother went all out for Christmas dinner with homemade cranberry mold (she was the only one in the family who could get it to gel) and sometimes even flaming plum pudding. Merry Christmas to you all, and a big hug to you and your family, Julia, as you start to explore new Christmas traditions. I think Hawai'i is a great idea. Oh yes we had tons of tinsel too Gigi, until we learned it could kill the cats. Sigh, tinsel, I miss it but love cats more. Thanks, Gigi! I have to admit, it's extraordinarily relaxing to have no dinner to prepare, presents to wrap, or snow to shovel! Instead, we're going to Volcano National Park before coming home and dressing for dinner out. 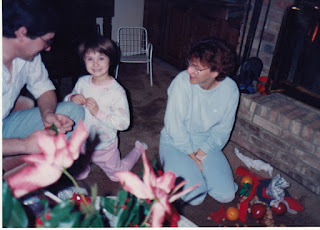 Until age 10, my parents and I celebrated Christmas at home. I left milk and cookies for Santa on Christmas Eve near the Christmas tree. We had a traditional turkey dinner. And my grandparents sent us a holiday parcel from Japan filled with Japanese goodies that we could buy in Toronto in the 1960s/1970s. Then we stopped doing any Christmas celebrations until I went away to university in the 1980s and we started making the turkey dinner again. But no Christmas tree or presents since our big family celebration took place on New Year's Day/week. Since I am laid up this year with my broken ankle, I have cut back on my normal activities. I did make some real easy Christmas treats (cookies, dark chocolate bark) to give out as gifts. With another 4-6" (8-12 cm) of snow forecasted to fall here in Ottawa tonight into Christmas Day, I won't be going out. Instead I will snuggle up inside with hot chocolate and I will adopt the Icelandic tradition of Jólabókaflóð (Yule book flood) this Christmas Eve. I have the perfect book to start reading tonight: WHITE OUT is the 5th book in the Dark Iceland series by Ragnar Jonasson. I love this series, and I think it is fitting that the book takes place 2 days before Christmas in a remote Icelandic village. Jonasson portrays the bleak, dark, cold, snowy and empty Icelandic landscape so well...sounds like it will be a perfect read. I love the Yule book flood idea and so jealous that you have WHITE OUT. Going to put it on my list now! Well, I binge-read the Dark Iceland series, Lucy. The trade paperback book price was cheaper than a mass market paperback in Canada ($11 CDN), so I bought the first 4 while I was in Reykjavik in February. And WHITE OUT was published December 1 and was ordered via UK's Book Depository. Again $11 CDN and free shipping! At least one of Jonasson's books will make my favourite reads of 2017 list. What lovely traditions. And Julia, I'm glad you're all getting away to someplace warm. When my boys were little we always read Night Before Christmas, too. These days we always spend Christmas Eve with our good friends in Medford, and this year there's a two-month-old baby, too! Christmas morning is always homemade cinnamon rolls and mimosas with gift opening. Merry Christmas, dear Reds and blog community. My only constant, forever tradition is the stocking. We would never give up our stockings! From when I was very young I always had a sort of fantasy I would find something fabulous in there - say a diamond ring or keys to a brand new car! What I did find: an orange and nuts and a paperback book as well as maybe socks or a new toothbrush. Funny Judi, though the book was a treasure, right? Absolutely, Lucy. The one I am remembering was an Agatha Christie, my first one. I might have been in 7th grade. I still remember the story with Miss Marple but not the title. I jsut did a search and found it! It's the '4:50 from Paddington', but when I read it it was 'What Mrs. McGillicuddy Saw'. I am the pageant producer at our church -- 4 p.m. today. I have cast granddaughters -- Annabel as Mary and Lucy as Gabriel/Angel. It will be a miracle if it all comes together, but that's what Christmas is. I have spent Wed-yesterday with my mother who had a health scare (all is well), so today I hope to finish up cards. We have dinner at our daughter's (three granddaughters!!!) Christmas Eve -- his parents come and this year we have our oldest daughter too. This will be the 4th year Colin had done Feast of the Seven Fishes (an Italian tradition -- we aren't Italian but New Haven has a lot of Italian influences, and good delis where you can get calamari salad). Tomorrow, we will be quiet most of the day. Daughter #2 and their two boys are staying home in Watertown, MA -- Daughter #4 is en route to Moscow, Idaho (inlaws). Until the house is filled with the sounds of granddaughters. Stockings, presents, carols, several performances by the grandkids -- and Roast Beef for dinner. Chocolate cake for dessert. I love that you are going to Hawaii, Julia! Love all your pictures and stories. Love all of you. Sounds like a wonderful holiday Denise--and so glad your mom is doing ok! God bless all Christmas pageant producers, Denise! You get a gold star in heaven for that ordeal. It's not even nine o'clock in the morning and I've already read Night Before Christmas three times ... It's a lovey poem but I do believe I will be sick of it by dinnertime. Ah, grandbabies. Mix it up with a Cajun Night Before Xmas - so much fun to read! 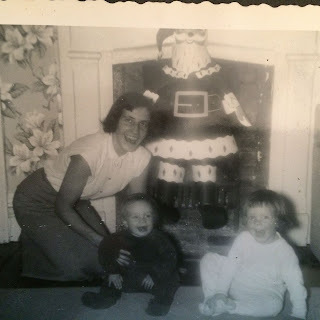 Stockings were never part of my childhood Christmas, but I introduced them to my children. Now Julie and I hang stockings but mostly for decoration. Aside: we exchange presents, fairly inexpensive ones because we already have everything we need and want. Prior to buying, we agree on a price limit, always exceeded, and the number, must be the same for each of us. Can you tell she came from a large family and I was an only child? This keeping the numbers even thing is new to me, didn't even do it with my kids. This year the agree upon number was five. And then I recounted, had six and no way to combine anything. So I put #6 in her stocking, thinking I could work it out somehow. So yesterday Julie finally got around to wrapping and put my presents under the tree. (High damn time if you ask me, but never mind. I am an adult.) Five presents, just as agreed upon. I don't mind, but I knew she was going to feel inadequate if I had less than she did. But what to my wondering eyes did appear? Another present for me, put under the tree yesterday afternoon. In a bag from a jewelry store too! Whew, that takes care of my problem. At midnight, too, not some wimpy seven p.m. like the Episcopalians down the street. High solemn sung mass, with all the bells and whistles, including brass and organ and lots of incense. Julie will sing like an angel, and once again, I will sit alone and listen and get a little misty, wishing my children weren't so far away. We should be home and collapsed in bed by 2 o'clock Christmas morning. Breakfast will be, like Rhys's, sausage rolls and little mince pies. And presents, six each, of approximate equal value, as if we were seven years old. I am drooling thinking about the five fishes cioppino, Ann! And, yes an intensifying storm from Texas and the lake effect machine is bringing plenty of snow to both sides of the Great Lakes this year...enjoy!! For many years, we headed up to the cottage on Lake Winnipeg for the Christmas break, but this year it's just too cold for that (minus 40C with the windchill today - yikes), so a city holiday it will be for us instead. And that means I try my hand at my mother's shortbread recipe. Of course, it never turns out quite like I remember hers, but I think that's normal. Right? Isn't that normal? Amanda, it has been such a pleasure for us, getting to know you! It was lovely meeting you in Toronto, Amanda! I'm so glad you've joined us! Yes, it's normal. Things never seem to taste quite as good as we remember our mother's, even with the exact same recipe. You are welcome Amana, so happy to have you with us! Amanda, what a wonderful thing to say ! And the perfect gift. Xxxx We are off to do some last minute things, provided the ice has all melted… Could be interesting! I think I will hang up a stocking or two, and see what happens. :-) Love love love to you all! What a wonderful traditions and memories. In our family, our traditions are in tiers. Depends on where we are living - traveling folks are like that! As a young child, it was a sleigh ride on our maternal great grandparents farm while Santa decorated the tree and brought the gifts. As an older child it was decorating the tree with my father's family German heirloom ornaments and a family roast beef dinner for twelve. 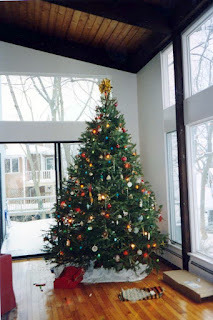 Years later when hubs and I lived in Maine we cut our tree from our woods and decorated it. Now that we are in Florida, we find ourselves treeless (they dry out too fast) but watching Christmas movies nightly! Kait, we spent quite a few Christmases in Mexico, outside Guadalajara. No Christmas trees, of course, but our house had potted plants in a sort of atrium, and we would string colored lights all through the plants. Didn't miss the tree all that much! Bob and I have sung in the church choir for many years, and at our parish, the choir gives a 30 minute "prelude" (virtually a choir concert) before midnight Mass. And we are one of those wimpy parishes where midnight Mass begins at 10. So that's the crux of our Christmas Eve. In the morning, the four of us will eat breakfast but nothing special, then open all the gifts under the tree and later, enjoy a proper Christmas dinner together. This year I'm doing roast beef, though ham has been more of a tradition for us. The more unique tradition, perhaps, is with my husband's family. His mother was the head nurse on the children's unit at their local hospital, so 30+ years ago as her children were becoming adults and marrying, she actually preferred to work Christmas day to give the younger nurses with small children the day off. She established the practice back then that their family Christmas observance would be on the weekend between Christmas and New Year's. ("I'll make sure my daughters-in-law all love me," she used to say in only half-jest.) That pattern has never changed, so next Saturday as many of her eight children as can make it, along with their spouses, and their children (and increasingly, grandchildren) will gather at her house for another Christmas. Frankly, it is always my favorite part of the holidays. Not only do I enjoy the company, and the inevitable hubbub caused by the sheer number of people, but I think it is especially relaxing in that it is the final hurrah of the season. I just wanted to add my own Merry Christmas to all of you! This is a lovely community you've built here and I feel blessed by it all year long. Susan, what a lovely story and tradition! And a Merry Christmas to you, too! Warm wishes to all the Reds and readers for a lovely holiday--the tree is up and trimmed here, the boys' stockings will be filled tonight, and tomorrow part of my sibs will gather here for Christmas dinner. On Boxing Day, I will be hosting an open house for my other sibs and their children and grandchildren and friends--and I will be serving Rhys's sausage rolls! Thanks for sharing the Christmas photos--such treasured memories! thanks for being a part of our Red family! So fun to read all these! 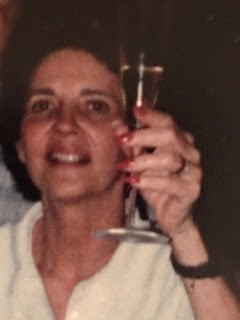 After we got married, and especially after we had the boys, we seldom stayed home at the holidays; we alternated between my parents and in-laws. With my in-laws gone, we now spend either Thanksgiving or Christmas with my family each year. This year we've got four generations celebrating together, which thrills all of us. We have a miniature tree that we had gotten for my father-in-law's nursing-home room, and we've set it up in our hotel suite with presents around it. Our generation has for several years "given" each other donations to charitable causes for gifts; as others have said, we've got enough stuff. We don't really have food traditions, other than eating too much of it. There are too many of us to host a meal comfortably in anyone's home, so we'll go out to an early dinner this evening and have pie and ice cream at my parents' place tomorrow. A lot of the activities will center around the youngest generation, who are six and two. Julia, thanks so much for confirming Die Hard as a prime Christmas movie! We were having a conversation about this yesterday. I think we'll probably watch Love Actually, though. Like others, I'm very grateful for this community and all the contributors. I wish all of you and yours a wonderful holiday! And we are very glad to have you here--enjoy your gang! Jim, that's amazing that you've got four generations together to celebrate. That must feel very special, and I love that you put up the tree in your hotel suite. My husband and I always get a bottle of amaretto to have back at our room in the inn, so we can have a mellow nightcap at the end of the day. We don't usually do that at home, which makes it feel festive. We are a stocking family too. I love everything about Christmas. Everyone's Christmas traditions sound lovely. I grew up with my parents and an older brother, and we shared Christmas with my Aunt, Uncle and two cousins. So Christmas was 4 adults, 4 children, of which I was the youngest. We alternated Christmas between our home in Southern California and theirs in Pebble Beach. The visiting family always stopped in Solvang on the drive to buy Danish at Birkholme's Bakery there. It was a must, and we had it for Christmas breakfast. Oh, so good. BY Clement Clark Moore ('Twas the night before Christmas) read to me, (the older cousins were't interested) by my Mom. We had stockings, oh yes we did! All handmade, with our names on them, but not hung up and filled until Christmas Eve, after the young 'ins had gone to bed. There was always a tangerine in the toe, and a small toy. The rule (there seemed to be a lot of them) that the children could not get out of bed and get the stocking until 6am. Then we could get our stocking and return to bed with it QUIETLY. Adults got up around 7am, and then everyone got dressed, and breakfast was served, the aforementioned Danish, juice, coffee, eggs. As a little kid, it seemed to take for-ever! Finally breakfast would be over, the dishes washed, the kitchen cleaned(!). We would all go sit around the tree and gift-giving would commence. One child (usually not me) was designated the "giver" and the adults would specify which gift was to be given. Then the child would get it, read the tag, and give it. The recipient would oh and ah over the wrapping, open it carefully, show everyone what it was, and then an adult would point out the next gift to be given. THIS ALL TOOK HOURS, and to kids, who wanted to get and open their presents NOW, it was excruciating. Eventually, it was all done, and my Aunt had saved what wrapping paper she could, and we could go off to enjoy our presents. Whew. Meanwhile my Mother and Aunt made made Christmas dinner which would be at about 3pm. Usually the traditional turkey dinner. Now? Just two of us, but we have a tree, stockings hung on the mantle, decorations of various kinds about the house. Candles lit each evening. We don't put things into the stockings, as it's too near the fireplace, which is lit throughout the days and evenings, but the stockings get filled sometime during the night or first thing in the morning. We open them when we get up, then Christmas breakfast these days is cinnamon rolls and coffee, then we open the other things. Since it's just us, there aren't many but it's still fun. Oh, and tonight, Christmas Eve, there'll be spiked (bourbon) eggnog. Ahhh. Rhys, congratulations on the review in th NYT this morning. When I was growing up, my family never had any Christmas Eve traditions. Dinner was usually leftovers, or mac and cheese(Kraft's!) As we got older, we started going to Midnight Mass instead of waiting until morning. There were stockings, of course. We lived in an apartment. Having no chimney, we hung them on the back of the couch. My parents made sure to keep the door unlocked so Samta could get in. We had an early Christmas dinner and then went to visit each set of grandparents for about an hour each. Happy chaos, as there were lots of cousins on each side of the family! My siblings and I live in three different states. The one that lives closest is about an hour away. I'm joining her family for dinner tomorrow, which will include their lovely grandchildren! Weather permitting! Snow is in the forecast, and I don't drive in snow! As a kid I loved to go to midnight Mass, but I've been a heathen now, lo, these many years. On Christmas Eve the youngest reader in the house reads The Night Before Christmas to us all, and we put out cookies and milk for Santa. This will be the first time in years we won't do that. On Christmas morning we start the cinnamon rolls while we open the stocking gifts and have coffee, hot chocolate, or mimosas, then break for rolls, served on my Christmas plates, then go back to the other gifts. Each gift is opened separately, in turn, so we can all enjoy seeing the joy of the recipient. That's my favorite part of the gift-giving ritual. Christmas dinner is a big deal for us. This will be my first time cooking for awhile, since my daughter is here this year--we've gone there for awhile, so Santa could find my grandson--so I'm cooking my favorite pork roast with rosemary, garlic, apricots, and dried cranberries. It's probably our last Christmas in this house, so we'll make it a good one. In the evening we play games. Apples to Apples is our favorite for the last few years, because even the young kids can win, and we all laugh like crazy. Merry Christmas and joyous peace to all. Merry Christmas Karen. Think of me at midnight mass.